At the start of the month I went to the Loo of the Year Awards. Spolier: the overal winner was Ceredigion County Council(map). It was much more lively than I expected, a Star Wars intro style video told us the previous winners to date. There were bright lights on the stage and awards were announced to upbeat music (inc. LMFAO’s Party Rock Anthem). When I tell people where I went, the obvious question get’s asked: who won? There were a few hundred winners of awards, we have some fantastic ‘away from home’ toilets in the UK! 78% of toilets entered got 5 stars from their inspection, and this year none got below 3 stars. The award announcements were interseeded with an explanation of the important work Changing Places are doing, a talk & practice of handshaking, and a performance by singer and comedian Sean Williamson (Bobby Davro was ill, but I’m more than happy with the replacement). 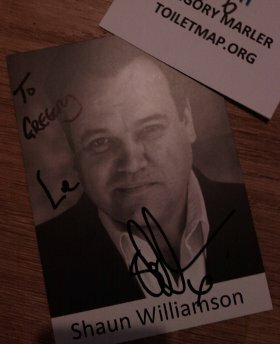 I had a chat with Sean (aka “Barry from Eastenders”) after the awards. He’s a nice guy, and we exchanged business cards. On the same day, I pushed my website out of private testing, and made ToiletMap.org public. It still has a few issues and a long list of usability improvements I need to work on. I’m fixing some when I have a moment, such as the buttons are now more obviously buttons to click. You should be aware that toilet locations don’t display when you are zoomed out too much. There is a message in the top right corner to tell you when to zoom in, that needs to be a lot clearer. I haven’t had any sponsorship interest yet, and that would really tell me it’s worth spending a bit more time on this, and I’m not looking for much money but more interested by the act of support and a company name to mention in press releases. My next plan would be to make a phone app (or mobile website), which makes sense. This would then lead on to a different website design, where you go through some simple steps to find your nearest toilets (or toilets along a route). The current website design, originally done to show how many toilet locations/information we know, would be kept available as a sort of ‘advanced’ view. This entry was posted in Website Updates and tagged geospatial, mysql, php, postgresql, public data, toiletmap. Bookmark the permalink.